Get in the mood for a long weekend on the couch with Tiger, Rory and the rest with seven of our favourite moments at Augusta. Attendants put Tiger Woods' name on the scoreboard last year. On the final day of the 1935 Masters, Gene Sarazen pulled off something spectacular. Something so special that tens of thousands of people would later claim to have been there, to have witnessed it in the flesh. He scored a double-eagle, the rarest of all birds, taking just two on Augusta’s 15th hole. When later asked how many people had been present, Sarazen didn’t need to use too many fingers to figure out the answer. Eight – including Masters co-founder Bobby Jones and another top pro Walter Hagen. There were no cameras, no photographers, no journalists. In fact, if Sarazen’s later account is be believed, the one scribbler who had been following him around decided to pack up the 1930s-equivalent of a laptop and head off for a swift half at the 19th shortly before the historic moment occurred. After a solid tee shot, the five-foot-six pro affectionately known as “The Squire” was left with a 235-yard shot to the pin. Back then, there was a small little creek in front of the 15th and the sensible player would have laid up. Sarazen was confident though and, with two of the game’s greats as witnesses, he let fly. The rest, as they say, is history. At the time, he had been three shots behind tournament leader Craig Wood. With one stroke, Wood’s advantage was gone and Sarazen was back on level terms, forcing a 18-hole playoff the following day. As he said himself afterwards, without victory in the tournament, the shot would have been sadly irrelevant. CBS sportscaster Ben Wright called it perfectly as 46-year-old Jack Nicklaus — five-time US Masters champion Jack Nicklaus — rolled in an eagle three at the 15th hole, bringing him to within two strokes of the lead. It was the most unlikely of fairytales and, despite Wright’s words, it still seemed terribly far-fetched at that point to think that the world’s greatest golfer might be able to pull it off. Nicklaus’ 1986 comeback was remarkable in two contexts. Though he had won five green jackets, becoming the first player ever to win back-t0-back titles in the process, the Golden Bear appeared to have lost his touch at Augusta. Gone into hibernation, to borrow the de rigeur cliche of the day. He hadn’t won in nine attempts, though he had managed a handful of impressive showings and top ten finishes. Still, the court of popular opinion had declared him too old to win. Four strokes behind leader Greg Norman at the turn on the final day, the field in front of Nicklaus was packed with talent – Lyle, Price, Langer, Ballesteros, Kite, Watson. It was almost unthinkable that he could pass all of them. But Nicklaus just kept playing his game. Birdies at 9, 10 and 11 kept him in touch with the leading group before a bogey at 12 very nearly ruined everything. Birdie-par over the next two holes redeemed him. Looking back, it may have been that understated combo which won Nicklaus the tournament rather than his celebrated birdies at 16 and 17. In keeping his head when all around were losing theirs, shooting a magnificent 30 to take his sixth green jacket by a stroke, the Golden Bear had outfoxed and outlasted the competition. Before even beginning to contemplate Larry Mize’s glorious chip-and-run to win the 1987 Masters, it is only right to reflect on the tiny — almost incidental — details which made his win so utterly memorable. This was the story of a local hometown hero, a native of Augusta, Georgia, an avid golfer whose first paid employment at the age of 13 had been to operate the scoreboard on Augusta National’s third hole. This was the story of a 28-year-old who, in six years as a pro, had only ever managed a single victory on the PGA tour. As Mize walked alongside Greg Norman and Seve Ballesteros to the tenth tee box to begin their three-man playoff, the contrast could not have been more striking. Mize in his own back yard versus an Australian and a Spaniard. His sole career victory versus their 96 combined titles. Against this calibre of opposition, nobody gave him a prayer. Even when Ballesteros uncharacteristically three-putted at the first playoff hole and bowed out, it was assumed that Norman would finally take his first green jacket. The approach shots to the 11th green seemed to confirm this reading of events. While Mize’s second ended up well short of the pin – 140 feet to be precise – Norman hit the front edge of the green, knowing that a two-putt would at least be good enough to take the shoot-out to a third hole. At least, it would have been good enough had Mize not pulled off a one-in-a-million shot. Loft, length, speed – all perfect, so perfect the ball couldn’t help but trickle towards the cup as an absolutely gob-smacked Norman watched from the sidelines. Still smarting from the blow of a most unlikely loss later that night, the Aussie’s reaction was every bit as memorable as the champion’s chip had been some hours previously. Earlier, we had a look at a misjudged stroke which has gone down in Masters history - Scott Hoch’s two-foot miss in 1989. 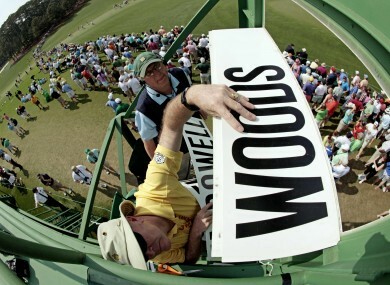 If Hoch’s blunder is the single shot at Augusta National most deserving of the “choke” label, Greg Norman produced the 78-shot equivalent on the final day in 1996. A professional scoring six-over par at Augusta is the most incredible sight in the world, but Norman’s implosion was mind-boggling when set against what had gone before. On Thursday, he had shot a flawless round of 63 to equal the course record, following that with two solid rounds to finish up with a not-too-shabby total of 13-under by Saturday evening. His nearest competitor and playing partner for Sunday’s final round, Britain’s Nick Faldo, was six shots adrift. All Norman needed to do was get around in level par and it would take some sort of a miracle for Faldo to wrest the green jacket from his grasp. Faldo’s target was modest, as the Briton later admitted. If he could halve the six-shot deficit over the opening nine holes on Sunday, anything could happen. He picked up a couple of shots early on in the round and Norman dropped one – by the time both men stood on the ninth tee-box, Faldo had hit his first mini-milestone. Nobody, however, could have foreseen what happened to Norman next – bogey, bogey, bogey, double-bogey. The shots fell away as quickly and easily as they had been accumulated on Thursday, a time and a place which felt a million miles away from Norman by this point. Incredibly, the Australian found himself teeing off on 13 two shots behind his playing partner. It was a disaster, but for as long as he was out there, he still had a chance to make things right. He somehow managed to make matters worse, taking another double-bogey when finding water at 16. The final two holes would be the longest two holes of his professional career. It takes something special to overshadow a final round of 67 at Augusta. A final round of 78 just about fits the bill. In 1975, Lee Elder stepped up to the first tee-box at the US Masters, making history as the first African-American golfer ever to compete in the tournament. It was the first sign that both Augusta National and golf in general, hitherto bastions of social conservatism, were slowly beginning to dispense with the racial relics of their common past. Masters founder Clifford Roberts is reported to have once said that “as long as I’m alive, golfers will be white, and caddies will be black.” That was the Augusta way until 1982, the first tournament at which pros were allowed to bring their regular (read: white) tour caddies to the Masters with them. Just 15 years later, the status of the African-American golfer would be changed forever by a 21-year-old from Cypress, California with a funny name – Eldrick Tont Woods. With three tour wins to his name prior to teeing off on Thursday, Tiger was hardly an unknown before his victory at the 1997 Masters. It was the manner in which he won, however, that turned him into a global superstar. With a nine-shot lead heading into the final day of play, Woods had turned what is normally one of the most thrilling and unpredictable days of the golfing calendar into a mere procession. And, as he turned that commanding advantage into a twelve-stroke win, he smashed every single record in the books – youngest ever player to win the Masters (21 years, 104 days), lowest total score (270, 18-under par) and biggest margin of victory all fell before the unstoppable march of history. “No one will turn their head when a black man walks to the first tee after this,” said Elder who had fittingly been present on the final day of Woods’ win. This sublime talent of this 21-year-old genius, already a great, was reason enough to make heads turn. It took Phil Mickelson 12 years as a professional and 43 attempts before he finally got his hands on the prize which seemed like it might forever remain just out of arm’s reach — a win in a Major. Obviously, in the Tiger Woods era, it became that little bit more difficult to negotiate victory in one of golf’s “Big Four” events. Mickelson had come close though, finishing in the top three on no fewer than eight occasions, coming agonisingly close to his maiden win at the US Open in 1999 and the PGA Tour two years later. All the while he was picking up wins on the PGA tour without too much difficulty – 22 by April 2004 to be precise. His arsenal of shots and the seemingly effortless skill with which he executed them made him one of the most heralded players in the game. And yet he just always seemed to fall agonizingly short on the big occasion. The best player to have never won a Major. The more it was said, the more it turned into a self-fulfilling prophecy. Third at Augusta in 2001. And again in 2002. The following year looked as though it would be the same old story, rehashed and repackaged 12 months after the last disappointment. Mickelson started the final day with a share of the lead – and then began to choke. He was two-over at the turn. His chance was slipping and he knew it. It almost would have been easier for him to pack up and phone the final nine holes in. It would have been in keeping with the script expected by so many. But he didn’t. Instead, he started to rally, stringing together birdies on the back nine until he found himself in a share of the lead on 18. His approach was everything he needed it to be and, as standing over an 18-foot putt for a birdie, for the Masters – for a Major – Mickelson’s time had finally come. This one needs no description. Quite simply one of the finest golf shots ever played. Email “The Magnificent 7: magic Masters moments”. Feedback on “The Magnificent 7: magic Masters moments”.